Kicking up dust in the African bush. 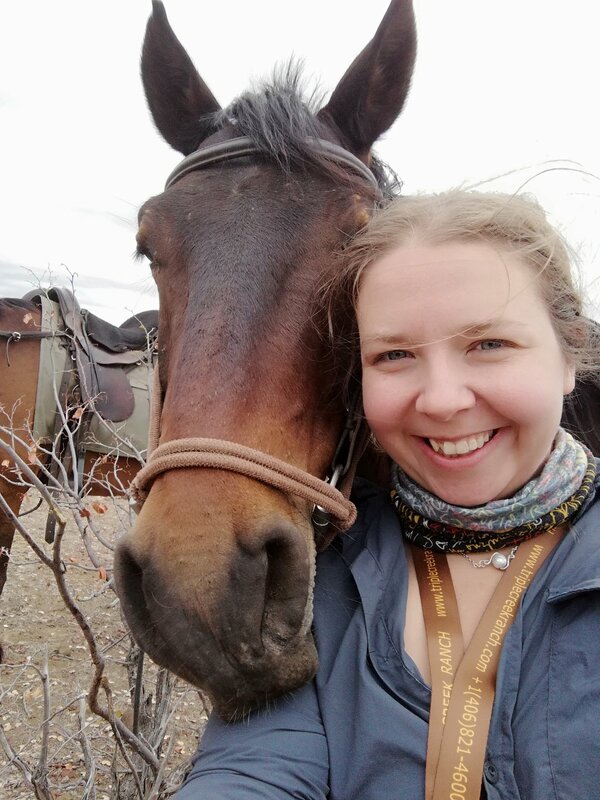 In this blog, In The Saddle’s Imogen Brown tells us all about her adventures on the Tuli Trail in Botswana which was the first time she had been on a horseback safari. 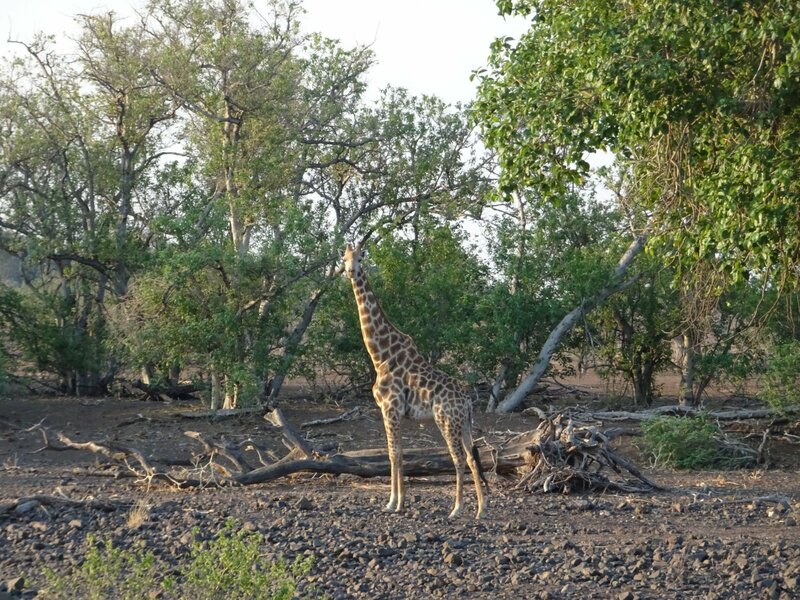 She writes …..
“A horseback safari, in particular viewing giraffe in the wild, has been at the top of my bucket list for a very long time. This trip had a lot to live up to. Waiting for my flight at Birmingham Airport I was full of excitement and nerves for the adventure that awaited me. I sailed through passport control and security at Johannesburg and exited from the arrivals hall into a stormy Africa. It was very easy to find the Intercontinental hotel which is the meeting point for the transfer to Lanseria airport from where we would catch our flight to Limpopo Valley. It took just an hour to get to Lanseria and we were very efficiently met, checked in and escorted across the tarmac to our light aircraft. Full of anticipation at Lanseria before we boarded the light aircraft for the flight to Botswana. The closer we got to Botswana the more the weather, and the visibility from the plane, improved. Before we had even landed we saw impala and giraffe from the sky. Limpopo Valley Airfield was nothing like any airport I had ever been to. 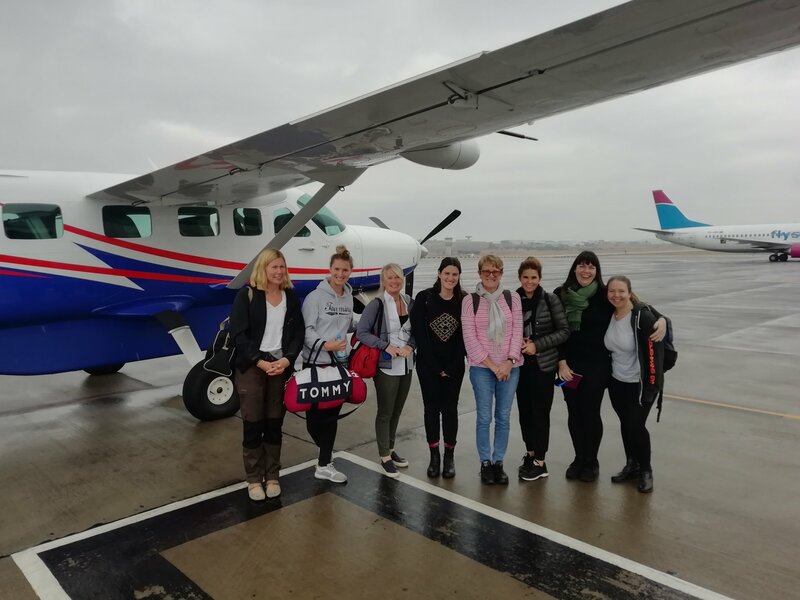 As we approached for our landing it suddenly began to feel real that we were actually going to be setting foot in Botswana in a matter of minutes. In such a tiny arrivals hall it wasn’t difficult to find our guide David who transferred us to the Limpopo Horse Safari stable to begin our adventures. Limpopo Valley Airfield arrival and departures hall. Lindy, the manager, met us at the stables and after a quick lunch we changed into our riding clothes and were introduced to our horses for the week. I would be riding a handsome 14hh Boerpard gelding called Million who instantly won me over. 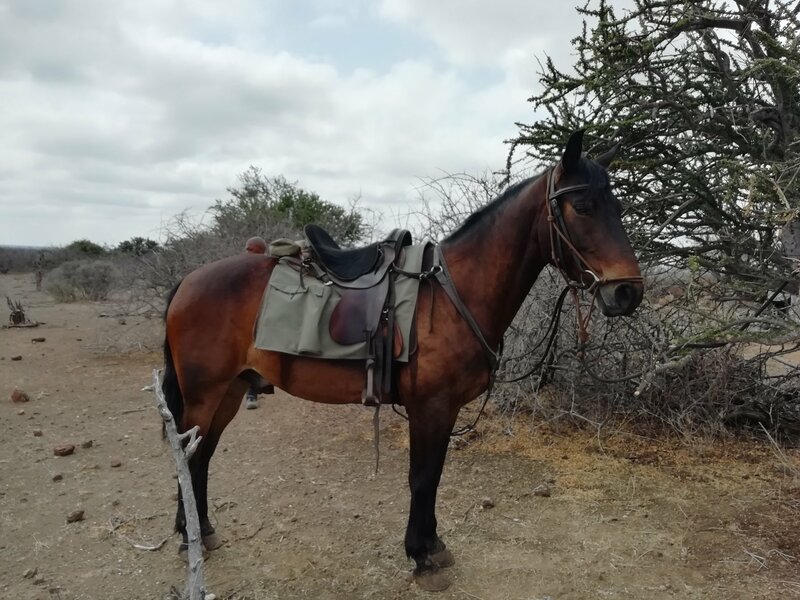 After mounting up and some stirrup adjustment, we began our ride to the first camp – an opportunity to get to know our horses and get our first taste of safari life. Wonderful fit horses make the best companions on this trail. It wasn’t long before we had our first blast in the Botswana bush to blow away the cobwebs from our flight. 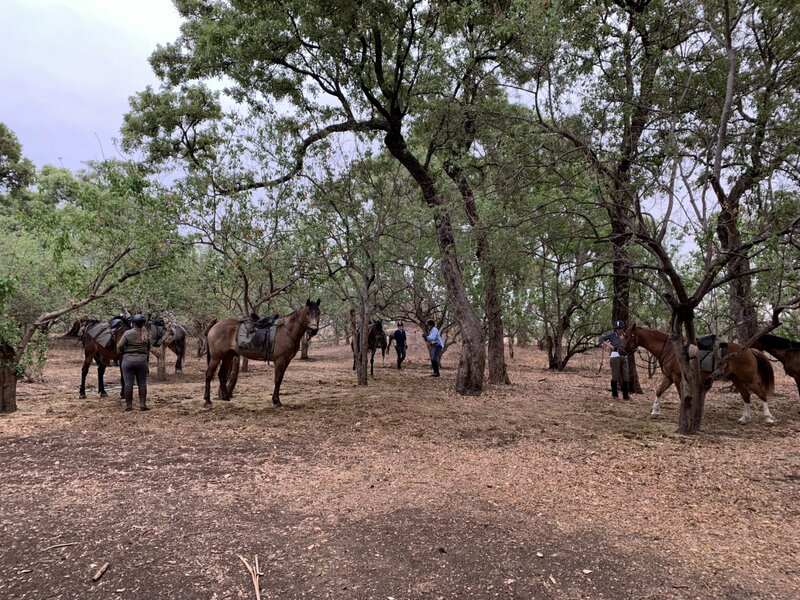 We stayed in single file as the route twisted and turned between the trees and the horses were brilliant and impeccably behaved. We saw giraffe, warthog, ostrich and impala before David pulled us up with a whistle and pointed up ahead to a lioness relaxing in the late afternoon sunshine. It was an incredible feeling to have already seen so much in such a short period of time. A young giraffe in the bush. We gave the lions a wide berth and once we were far enough away it was time for a second canter, kicking up dust as we went. We slowed as we got closer to camp, riding past a tree full of baboons and into the thicker bush. Suddenly, David whistled for us to stop. I was lucky enough to be near the front and hear the whisper of “elephant” from our guide who was pointing ahead. I managed to glimpse a grey leg and trunk through the leaves before we turned tail and headed back in the direction we had come. We arrived at our first camp Two Mashatus as the sun was setting. My tent at Two Mashatus Camp. The tents were nothing like we have when we go camping in the UK. 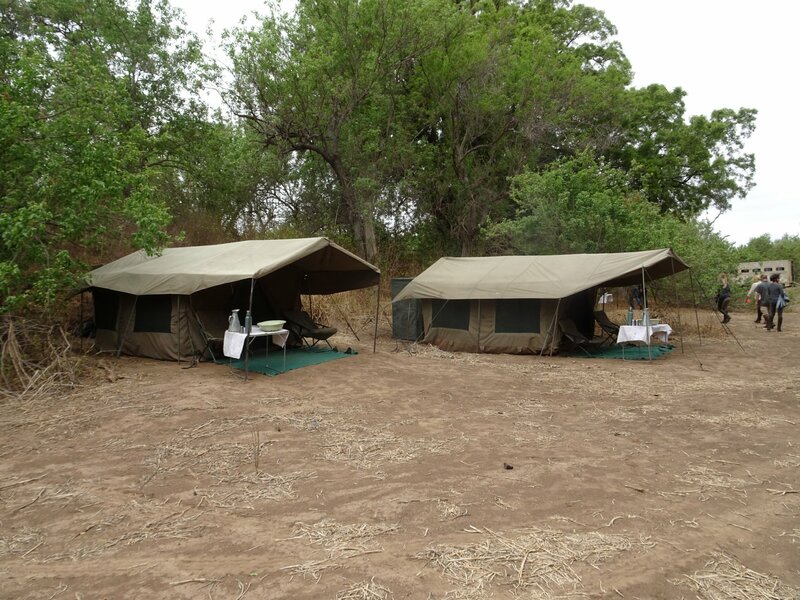 These tents were fully kitted out with twin beds, mattresses, duvets, pillows and blankets. 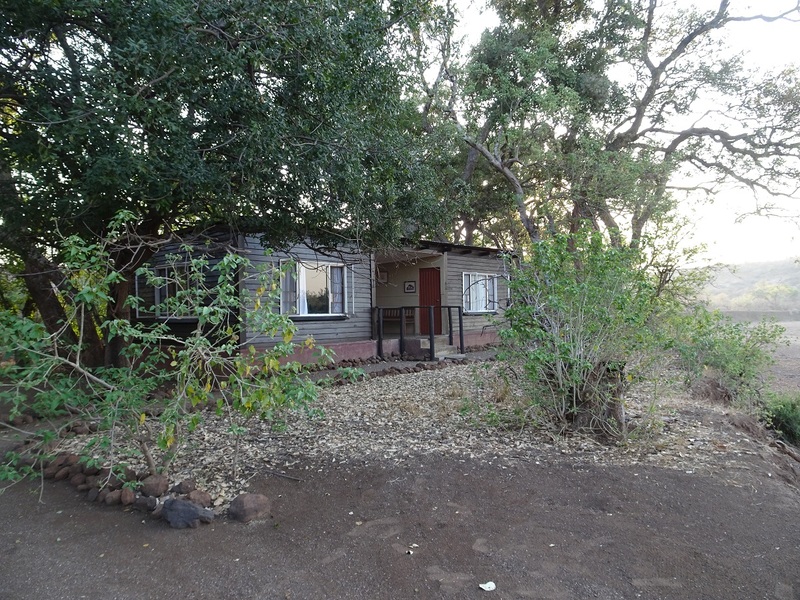 There are solar powered lights and an en-suite bathroom with flush loo and running water shower. After a refreshing shower to rinse off the dust it was time to head to dinner. Head torches on the Tuli Trail are a must!! Dinner was delicious and after a second gin and tonic it was soon time for an early bedtime in preparation for our first full day on Safari. Happy horses waiting to set off. The wakeup call on the Tuli Trail is 05:30 with a visit from our guide bringing tea (or coffee) as you like it. There isn’t any other feeling like waking up to the African sun streaming into your tent and enjoying a hot cup of tea. After a quick breakfast of cereal, toast, omelette and fresh fruit we found our horses tacked up and waiting for us behind camp. Excited and ready for the day, we hopped on board and began our ride to camp number two, Majale River camp. Today’s ride gave us a real feel for our horses as we began to get used to the style of riding and each horse’s quirks. Despite being the smallest horse of the group, Million’s favourite place amongst the ride was up at the front with his best friend Max, our guide’s horse, and would outpace the biggest horses to stay there. 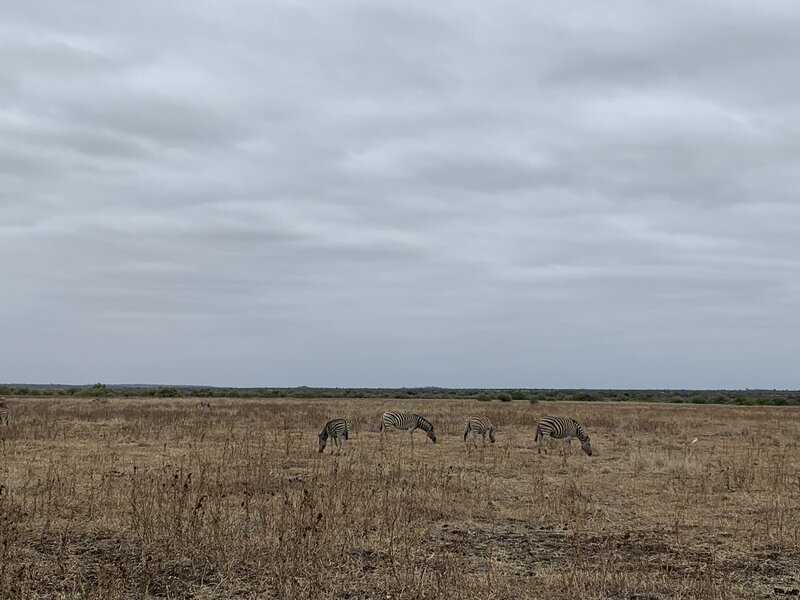 Throughout the day we had lots of long canters and some wonderful game viewing including zebra, giraffe, warthog and even cheetah. Watching zebra graze from horseback. After about five and a half hours of riding we arrived into camp, untacked the horses, let them roll and tied them up with a hay net and large bucket of water. After they had all cooled off they would be hosed down by the grooms before having the afternoon to relax. After a delicious lunch of spicy chicken and bean wraps followed by fresh fruit salad we had time to relax, watch the game in the river bed and to have a snooze in the African heat. Soon it was time for afternoon tea and a game walk with David. This gave us the opportunity to get closer to the smaller insects and learn more about the fauna and flora of the area. David also explained the basics of tracking and taught us how to recognise the species and the direction of travel. 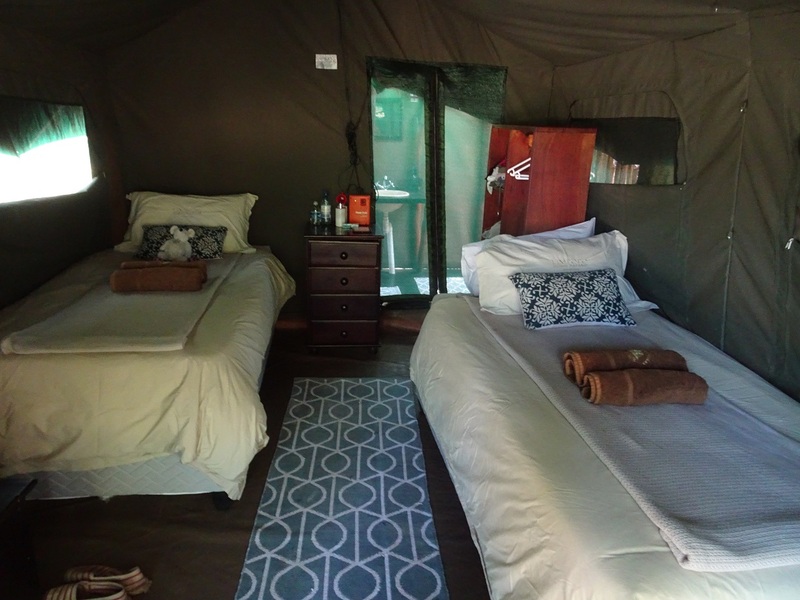 Accommodation at Majale River Camp. Dinner on the Tuli Trail is a relaxed affair with three courses, gin and tonics and good company. The evening flies by and all too soon it is time to head to bed. A goods night sleep really does set you up for the day. Throughout the trail you stay at four different camps in total and I felt a real sense of excitement and adventure as we set off early in the morning to find our next camp. Each camp has its own individual qualities that make it special and everyone has their opinion on which camp is best. The Kjotla is an open air secure boma. This is a traditional African enclosure which is made up of a circle of Leadwood Logs. After initial concerns about safety and monkeys in the trees we all settled in and for many of us this became our favourite camp. Kjotla is an open air communal camp. The fourth camp that we stayed in was called Liana and this was a mobile fly camp just set up for our one night here. We were all in A-frame tents that we could easily stand in, with beds, mattresses, duvets and pillows. Liana is the most basic of the four camps with a long drop loo per tent and one bucket shower for the whole camp. 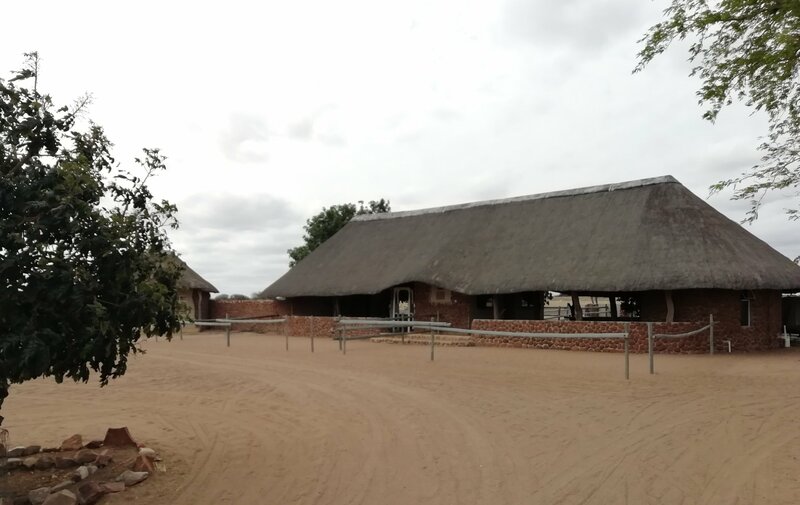 This camp has an authentic feel of being in Botswana and despite not being far from Two Mashatus camp, you really do feel out in the wilderness. 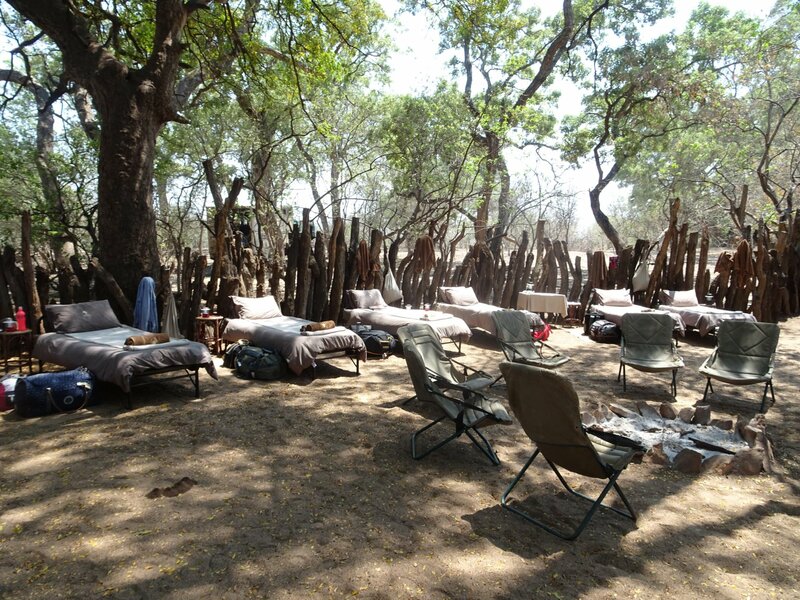 Liana Fly Camp set up in the dry river bed of the Limpopo River. It isn’t only from horseback that you have the opportunity to see game. On our afternoon at Liana camp we had the opportunity to go on a game drive prior to sundowners. This was a brilliant experience as it allowed us to cover a much larger area and see a whole host of game, including lion and elephant. 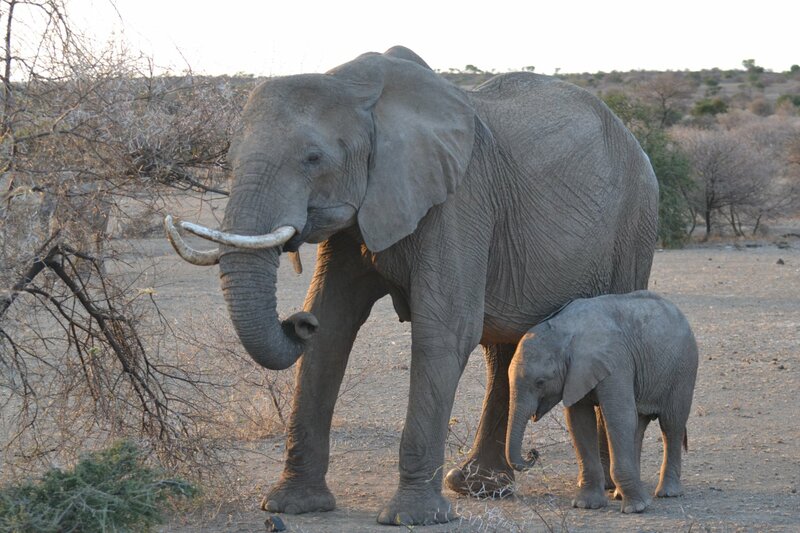 The Tuli Block is famous for large family herds of elephant and it was incredible to spend time so close watching these fascinating creatures. Incredible close encounters with elephant on our game drive. On our last day it was with heavy hearts that we mounted our wonderful steeds for the final time and headed out on our ride back to the stables. Our time in Botswana had flown by and it was going to be a surreal experience heading home to “normality”. Waking up at home and not being able to hear the lions calling, the horses eating breakfast or having canvas above my head would be a strange feeling. Imogen and her wonderful steed, Million. If you would like to find out more about the Tuli Trail please contact Imogen on +44 1299 272 242 or email imogen@inthesaddle.com.